Do you have half a day free to go sightseeing around Katherine? 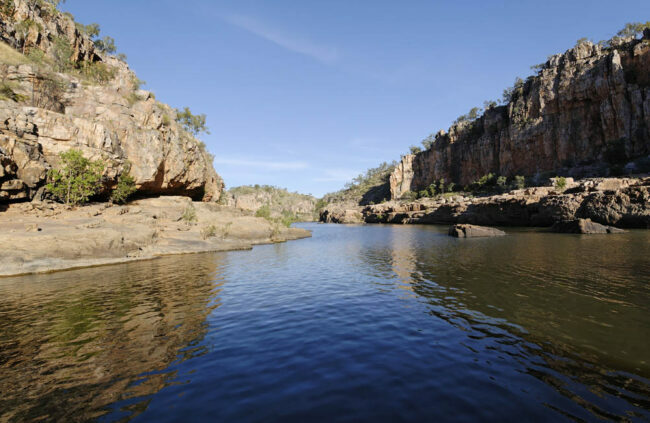 If you are visiting Katherine and staying at the Beagle Motor Inn, you absolutely need to find 3 to 4 daylight hours to head over to visit the Gorge, named Nitmiluk (pronounced “Nit-me-luck”). You’lll be able to make memories to last a lifetime and have a bite to eat in a sensational environment.You’ll need you own transport. Drive only 29kms and feast your eyes on the picturesque Nitmiluk Gorge. Nitmiluk means “place of the Cicada Dreaming” with all its ancient sandstone cliff faces carved throughout time by the Katherine River. Whilst you can hike the Gorge on your own, we find that the best way to take in all it’s beauty is to jump on a tour. We love the below 2h tour where you jump on a comfortable boat and won’t even get wet. Option 2 (early morning): those early risers a 2 Gorge Sunrise Cruise (also 2 hours) may be an option. Both cruises glide through the majestic river system. There are steps and walks of approx 400m each way to help you meander through the beautiful scenery boasting breathtaking views of rock art on the ancient sandstone cliffs. You will discover the cultural significance to the Jawoyn people, the traditional landowners, and listen to dreamtime stories from your tour guides. Option 3: a kayak tour. You may get a little bit wet but this is an experience you will never forget. For those of you who are after a little more adventure, we recommend the half day kayak tour. The easiest way for you to book is to let us know when you book your accommodation or give us as much advance notice as possible as these tours are one of the most popular and get booked out early. Contact us via email on info@beaglemotorinn.com or call 08 89723998. Where can I eat before or after the tour? On your return journey stop and savour a delicious snack at the Sugarbag Cafe located at the gorge whilst sitting on the elevated deck taking in views of the river filled with blue-face honey eaters. You don’t need to book and they cater to various food allergies and requirements.